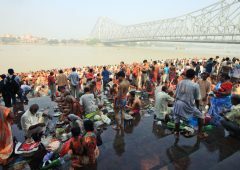 Navaratri in 2019/2020 - When, Where, Why, How is Celebrated? Navaratri is a Hindu holiday which occurs over a nine-day period in either September or October on the Gregorian calendar. This holiday is observed all throughout India and it commemorates the slaying of the demon Mahishasura by the goddess Durga, a battle that took nine days and nights. 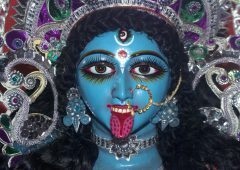 However, in some parts of India, this period of time is also used to commemorate all female deities. At its essence, Navaratri celebrates the triumph of good conquering evil and is also a way to give thanks for a good harvest. While it is celebrated in different ways in different parts of the world, most celebrations feature colorful clothing and fasting followed by elaborate feasts. On the Hindu calendar, Navaratri begins on Ashvin Shukla Prathama and ends on Ashvin Shukla Navami. In different parts of India, different legends account for the history of the festival of Navaratri. In Northern India, there is one legend, in Eastern India a completely separate legend and yet another one for all of the rest of India. However, while all of these stories seem to be different, they are all interconnected, complement each other and represent different aspects of the holiday. According to the story, as told in Eastern India, it all begins with Daksha – the king of the Himalayas. This king had a very beautiful and virtuous daughter whom he named Uma. His daughter had been a devout follower of Lord Shiva her entire life and wanted nothing more than to marry him. She worshiped him devoutly and eventually, he called on her to marry him. However, this displeased her father Daksha, so be ended his relationship with his daughter and her husband Lord Shiva. Eventually, Daksha organized a ritual offering known as a yagna but did not bother to invite Lord Shiva to it. Uma became so angry at her father’s rudeness towards her husband that she decided to take her own life by jumping into the yagna’s fire pit (known as a agnikund). In the agnikund she was united with eternity and later became reborn to once again win her husband Lord Shiva’s hand. Ever since then, according to legend, Uma comes back every year with Ganesh, Kartik, Saraswati and Laxmi to her parent’s home during this holiday. In Northern India, the story begins with a demon called Mahishasura. This demon worshiped Lord Shiva until he was granted the power of eternity. After he obtained this massive power, he then began to not only harass and kill innocent people all over India but also set out to win the three Lokas: Urdhva Loka (the heavens), Madhya Loka (earth) and Adho Loka (the underworld). Eventually, the gods of swargaloka pleaded with Lord Shiva to give them a way to dispose of the demon. The Trinity of Brahma, Shiva and Vishnu united all of their powers and created Goddess Durga – a divine female warrior. She then set out to defeat the demon. When Mahishasura laid his eyes upon Goddess Durga, he was instantly mesmerized and fell in love with her. He then approached her for her hand in marriage. Goddess Durga accepted his proposal but gave him one condition: he would have to defeat her in battle. He agreed and for the next nine days and nights they battled. Eventually, she defeated and beheaded the demon. Ever since then, the nine nights have been known as Navaratri. The day following this holiday, the tenth day, then became known as Vijayadashmi and is a celebration of the triumph of good over the forces of evil. In yet another story, the Lord Rama is said to have worshiped the Goddess Durga for nine days in order to gain the strength to kill Ravana – the demon king of Lanka. Lord Rama wanted to release Sita – the daughter of King Janaka of Videha who had been kidnapped by Ravana – and free her from his clutches. Those nine nights he worshiped Goddess Durga would then later became known as Navratri. The day following these nine days, the tenth day, was the day in which Lord Rama slew Ravana and this day became known as Dusshera. As with the other legends, the tenth day represents the triumph of good over evil. As is the case with the stories behind Navratri, this holiday is celebrated in different ways by different people in different regions. In Bengal, there are usually parades featuring large idols and these parades can be quite elaborate and very, very colorful. In some parts of India, earthen pots are painted and filled with either water or a lamp and these pots symbolize the power of Goddess Durga. In other parts, plates are decorated in honor of the mother goddess. This period of time is seen as one of great auspiciousness, which is why many women buy new clothes, jewelry and kitchenware. In most areas of the country, women will wear their most colorful clothing throughout the nine days. Fasting is also observed during this time. While some people will not eat any food whatsoever during parts of Navaratri, other people will simply abstain from some foods. The foods which are abstained from are usually corn, cornstarch, onions, garlic, lentils, legumes, rice, alcohol, coffee and refined oils. However, this is not a comprehensive list and some practitioners will abstain from other types of food as well during this nine-day holiday period. Oftentimes during this holiday, there will be many celebratory meals which include dishes such as Kuttu Ka Dosa, Singhare ke Atte ka Samosa, Banana Walnut Lassi, Sabudana Khichdi, Aloo ki Kadhi, Arbi Kofta with Mint Yoghurt Dip, Kebab-e-Kela, Sonth ki Chutney and Samvat-Pulao.